Cellular is one film that should be in your library, because you’ll want to see it again! If you are a lover of fright films that keep fear on a high level then see Cellular now available on Blu-ray for the first time in the United States. The creative film has excellent acting, imaginative directing and a great script. If that's not enough to get the Blu-ray here's another reason to grab it, the smart interesting bonus features. It's a beautiful morning and Jessica Martin (Kim Basinger) a science teacher walks her son to the elementary school bus stop. Waving good-bye Jessica smiles and breaths in the crisp air on her way back home. When she arrives at her home and enters the kitchen three men break through the back door and abduct her. Sequestered in the attic of an old house and not knowing why she has been kidnapped Jessica is frightened and bewildered. Ethan (Jason Statham), the leader of the trio of abductors enters the room with a sledgehammer and as Jessica panics he smashes the wall telephone above her head. He leaves the room and locks the door. After a short time, Jessica notices that the wires to the shattered phone still carry power. Using her science knowledge she starts twisting wires together and flicks two together in hopes of reaching someone. Ryan (Chris Evans), a teen that just got his first cell phone gets the call from Jessica and at first thinks it's a joke. When he realizes that she is in danger, Ryan starts on a wild mission that turns extremely dangerous. The fast passed thriller locks you in from the very beginning till it's startling ending. I enjoyed every minute of the movie, including the fine acting by the whole cast. Seeing the young Chris Evans in this role and his ability to command the screen, gives credence to his future role of Captain America. The hero role here may not be in the grand scale as The Avengers, but it certainly makes Cellular work. Kim Basinger does a terrific job of keeping her character real, wavering from panic to fear then bravery in the sight of abominable danger. Director David Ellis keeps Jessica in the picture as he develops Evan's Ryan who becomes the extension of her hopes and fears. His ability to create suspense with the two far distances apart, continuous excitement by interjecting elements that come between Ryan and Jessica preventing an immediate resolve and a startling finale that wraps up a wild roller coaster ride shows Ellis's brilliance. There's a standout performance by Jason Statham in the role of Ethan, a vicious killer unlike any of his previous performances. He's not the heroic Frank Martin in The Transporter, but he certainly has the brutality and fearsome fighting that gets transferred to Ethan. While you root for him in the Transporter, he brings a loathing to his character in Cellular. 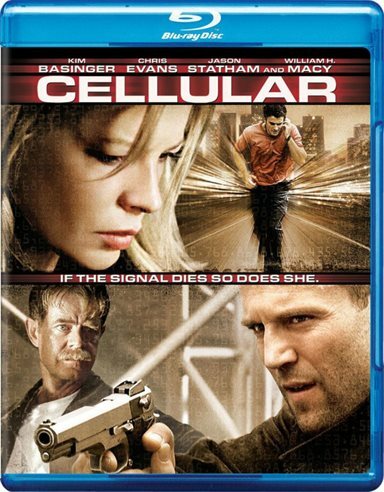 Cellular has been rated PG-13 by the MPAA for terror situations, language and some sexual references. It also contains to brutality and has scenes of a child in peril. The Blu-ray Disc has some of the best bonus features that I've ever seen at this level of production. Dialing Up Cellular: This feature shows the behind the scenes in a making of Cellular with Director David Ellis getting a lot of praise from his actors and rightly so. The main stars are highlighted as they talk about their characters and how Ellis worked with them to get just the right performance. If you are into movies you'll find some excellent filming techniques used in the production that are shown in an unusual way. From sound to photography and everything in between this bonus keeps on giving. Code of Science: Inside the Rampart Scandal- First I would like to note that you should not watch this feature until you have seen the film as it does give away a major plot point. This documentary contains some very damning facts that intrigue. Celling-out: A very cool documentary on the first telephones all the way up to 2004 when the film was made. It provides some very funny comedy, amazing inventions and information on how cell phones work. What's even more fun comes with knowing what are current cell phones can do in just a few short years. The quality of the Blu-ray is extremely good, especially when shown on a High Definition television. I liked the Widescreen format because it fills the whole screen. The DTS Master Audio enhanced my experience with all the explosive action scenes. The surround sound in my system made the cell chat very realistic. Download Cellular from the iTunes Store in Digial HD. For more information about Cellular visit the FlickDirect Movie Database.